Vespa Club Mantova, under the aegis of the Vespa Club of Italy, and MOTO ASI, with the contribution of the Vespa World Club, Historic Register Vespa, with the patronage of the Municipality of Mantova and with the organizational contribution of Vespa Club Pederobba, Vespa Club Portogruaro, Vespa Club Trieste, Vespa Club Porcia, Vespa Club Treviso, Vespa Club Montal and Old Vespa Club Trentino South Tyrol, organizes on 26th, 27th and 28th June 2015, the “12th edition of 1000 km Vespistica”. This a short preview of the route (which will be made official soon) very significant for the historical, tourist and scenic contest. • Departure from Mantua to the north towards Passo Zovo (631 mt), crossing the Asiago plateau (theater of the Great War), return to the plains to the south-east, arriving on the Adriatic Sea to the C.O. in Trieste, historical stage of the first editions of 1000 km; restart towards Palmanova to finally arrive in Porcia (PN) where, in the beautiful setting of Villa Dolfin, will be the neutralization of the times. • Departure to the north with the transition from Vajont Dam, then the Dolomites (UNESCO World Heritage Site that all the world envies us) in Cortina d'Ampezzo, Passo 3 Croci (1,809 mt), Lago di Misurina, Val Pusteria, Val Badia, Passo Gardena (2,137 mt), Castelrotto, downhill and arrival at C.O. in Egna. Then south along the Valle Adige, climb to Monte Baldo (1,620 mt) and finally down to the Mantova C.O. The beautiful setting of Piazza Sordello, as usual, will be the ideal stage for the conclusion of this “vespistic” adventure. 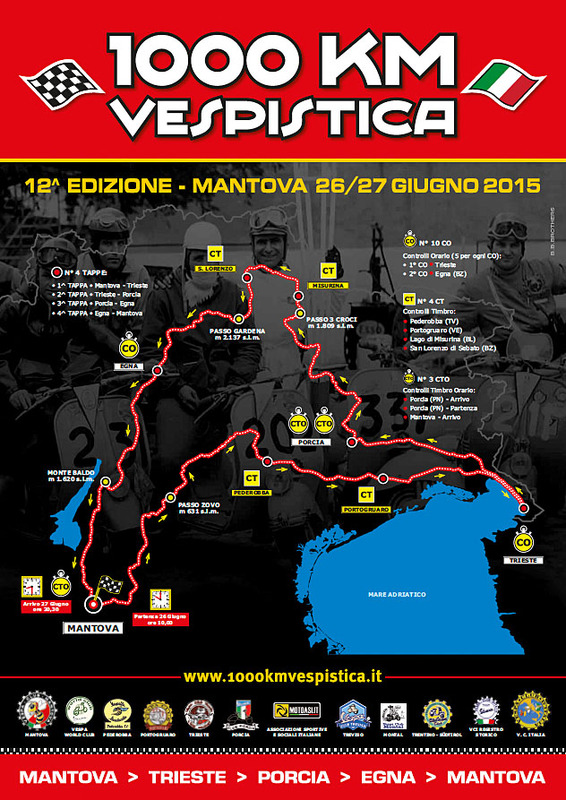 As with previous editions, the intent is to revive "the event" that more than any other has been and is the symbol of Italian and international “vespismo” where the mix of vintage and modern, sport and tourism, committed Vespa and participants in a challenge first with themselves and then with the stopwatch. It is still in everybody hearts and minds the edition of 2013 lived between prohibitive adverse weather, in an edition "epic" now consigned to history's of “vespismo”, where participants and Vespa had to "fight" for almost all the duration of the course, against cold, fog, water, hail and snow. There will be, along the way, "secrets controls", there will be an obligation to follow the official route (which is no longer suggested but imposed), there will be a duty to report and record the vans and other private care; few clear rules and failure to comply will result in immediate exclusion from the event of the participant. It is also introduced an additional selection criterion, in order to prevent participants from reaching the Time Controls with delays abysmal: participant has accumulated at C.O. on his/her own time imposed a delay of 60 minutes, will be exclused fro the event. We would like these rules were interpreted in the right way: we do not want that they will be obtusely punitive but we would like that they tell us that the "1000 km vespistica" is not to do a picnic with friends! It is the imposed average revival of an "Audax" and as such, should be lived both in spirit and in the preparation / conduct of Vespa. This is our "mission statement" we hope that you share with us the reasons that led to the introduction of new and you can appreciate the effort we made to make more exciting and interesting this event. The recommendation that will address, in addition to the usual of a carefully drive, is to carefully prepare your beloved Vespa and read carefully the Rules 2015. Please take note scrupulously with the provisions and pay attention to the new registration procedures: that's where it all begins and well begun is half done!